While most people think of workplace injuries as serious accidents involving falls or electrocutions, the majority of on-the-job injuries occur in the office while working on repetitive tasks. These injuries are referred to as musculoskeletal disorders (MSDs), and they account for approximately 33% of all workplace injuries. According to the Occupational Safety and Health Administration (OSHA), MSDs are one of the most common causes of loss of work time. If you have been injured at your workplace, or if you have begun suffering from a musculoskeletal disorder, you should understand your options for receiving workers’ compensation benefits. Carpal Tunnel Syndrome: Also referred to as median nerve compression, carpal tunnel syndrome is incredibly common throughout the United States, impacting more than three million Americans each year. These injuries are caused by the repetitive movement of the hand and wrist. The most common symptoms of carpal tunnel syndrome include pain in the hand or arm, numbness in the hand, a tingling sensation, and general hand weakness. Tendinitis: The repetitive motions performed in the workplace can put stress on certain tendons. Tendinitis is caused by the inflammation or irritation of a tendon. The most common forms of tendinitis occur in the shoulders, elbows, wrists, and knees. In the vast majority of cases, tendinitis requires a combination of rest and physical therapy. If untreated, tendinitis can lead to a ruptured tendon, which usually requires surgery to repair. Rotator Cuff Injuries: These injuries can come with chronic pain and lingering health complications. Whether they are caused by lifting heavy objects or another form of shoulder strain, rotator cuff injuries can have a long-term impact on one’s well-being. The most common types of these injuries are rotator cuff tears, which occur when the tendon connecting the muscle to the bone tears. Receiving immediate medical attention is critically important to avoiding chronic shoulder pain. Trigger Finger: This type of injury, which is also referred to as stenosing tenosynovitis, is caused by the repetitive movement of a finger, and it can ultimately result in the stiffening of the finger, as well as the possibility of the finger remaining in a bent position. Common symptoms include finger stiffness, a popping or clicking sound, and the inability to straighten the finger. Lower Back Injuries: Back injuries are alarmingly common in the workplace. These injuries can be caused by the lifting of heavy objects or simply by sitting in a manner that strains the lower back. An injury to the lower back can be chronic and lead to additional injuries moving forward. Much like the injuries above, receiving immediate medical attention can be critically important to a speedy recovery. No one should have to face the consequences of a workplace injury alone. At Flaherty Law, we understand the impact that a workplace injury can have on your overall health and your ability to earn an income. Even the most minor injuries can result in loss of work hours, expensive physical therapy, and long-term pain. When you are injured at work, you are eligible to receive benefits that address your medical care and compensate you for temporary or permanent disability. To set up a free consultation with a dedicated Plainfield workers’ compensation lawyer, call our office today at 815-577-7500. Every year, thousands of American workers suffer serious injuries while at work. According to the Insurance Information Institute (III), approximately 5,190 American workers lost their lives in on-the-job accidents in 2016 alone. The vast majority of workplace injuries are non-fatal, but they can come with monumental financial implications, including chronic pain or disabilities that impact one’s ability to continue working and earning an income. Fortunately, with the help of a quality legal team, people that suffer injuries or contract illnesses while at work can receive benefits in the form of workers’ compensation. Below, we discuss some common workplace injuries, some of the nation’s most dangerous fields, and facts about workers’ compensation in the state of Illinois. 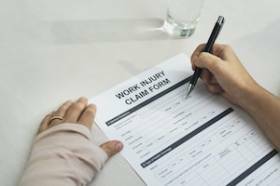 According to research compiled by the Insurance Information Institute, the vast majority of workplace injuries fall under a small number of categories. Most notably, on the job injuries often occur from vehicular collisions, falls, and exposure to harmful substances. These three types of injuries are also some of the most common forms of workplace fatalities. In fact, 40% of all 2016 workplace fatalities occurred in vehicular collisions. An additional 849 workers died from falls in 2016, as well as another 579 that were fatally injured through contact with harmful substances.